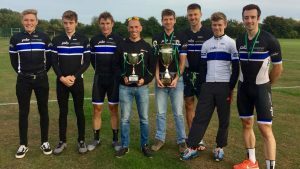 Celebrations yesterday as the team executed the season goal of winning the East Midlands Road Race League. The final race of the series allowed for a mix of national and regional riders and for our team ethic to be demonstrated to the full. Tristan Robbins, James Hill and Bradley Symonds played a huge part in ensuring that the regional team riders were fully supported in defending their individual places. 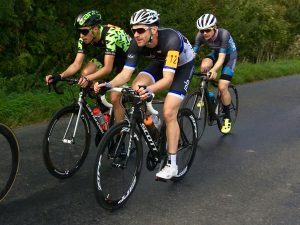 Both James Chapman and Toby Jarvis finished amongst the breakaways of the race securing their first and second places in the individual standings. Matt King finished strongly in the main group consolidating his fourth place overall in the league. This all meant that we were the top team in the rankings. To take home the team victory is testament to the way the team have gelled this year and demonstrates what can be achieved when riders truly do support each other. A fantastic season and one we have been proud to witness. Well done to everyone who contributed throughout this season long campaign!